This is where I would live! The builder we hired to perform some updates on the Squash House recently finished this garden cottage for a client. Isn’t it fantastic? 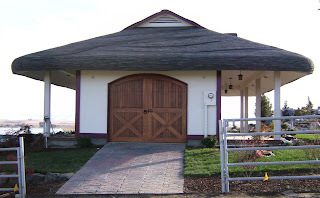 I just love the rolled, English style roof! He noted that he still needs to apply stone to the columns and some decorative angle braces, which they will do next spring. We feel so fortunate to have him working for us, and even better - he lives across the street from the Squash House! The day after Thanksgiving my husband and I were in Keepsake Cottage Fabrics in Bothell. He was patiently wandering around the store while I was loading up on purchases when he pointed out a darling wall hanging quilt by Mary Hickey from her book Comfort and Joy. I inquired about getting the pattern, which was sadly not in stock at the time. So I checked it out on Amazon and it arrived yesterday! I can pull all but the red border fabric out of stash! I’ve had great luck ordering quilting books on Amazon - there is almost always a lower priced used/nearly new copy for much less than full price and frankly, I can never tell that they have been used! That could not be any cuter!!! We had a near miss - I worked Friday, but not until 1 pm. Isn't that snowman cute? One of our shop employees, Joyce, made that for Mary's book. We call the book "Comfort and Joyce." The house and quilt are so neat. That house could not be more perfect! Hope he does just as good a job for you! I might have to order that book; it looks like fun! All that Work for Nothing! The Lovely Poinsettia and a Winner! !